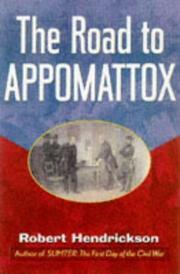 A Civil War narrative about the final days in northern Virginia leading to the great surrender. Historian Hendrickson (The Firing on Fort Sumter and the Start of the Civil War, 1987, etc.) begins the story on March 9, 1864, when Lincoln appointed Grant, “the General who fights,— as Supreme Federal Commander. Hendrickson gives a vivid account of what followed: Grant’s relentless hammering of the vaunted Army of Northern Virginia; the horrors and vast bloodshed occurring during the battles of Spotsylvania, the Wilderness, and Cold Harbor that wore down Lee’s outnumbered gallants in these fierce struggles of attrition; the long siege of Petersburg and the destruction and capture of Richmond. As Lee tried to escape south and west, he was attacked constantly by Grant’s fiery generals, Sheridan, Custer, and Ord, until the great Rebel commander was checkmated on all sides with his surviving half-starved army, in danger of annihilation. Hendrickson also gives a graphic account of Sherman’s March to the Sea and of the burning of Atlanta, which left a trail of devastation, looting, and pillage that broke the Southern ability to make war. Sherman justified the cruelty and barbarism of his warfare with his philosophy that he would thus end the war sooner and save lives, while warning that people would so loathe war that they would never again want to start one. The drastic tactics of both Grant and Sherman did finally end a long and bloody war. A lucid summary of this fateful period featuring profiles of the leading players together with colorful anecdotes.